Sunscreen is one of the most important steps in our skin care routine, especially in Australia! But when you're choosing a sunscreen for you and your family, did you know that there are two different kinds of sunscreen formulations? Both are designed to protect us from UVA and UVB rays. Discover how chemical and physical sunscreens use ingredients to help shield you from the suns rays in different ways. According to the Cancer Council Australia, skin cancer accounts for 80% of cancers diagnosed each year. That’s why it’s so important to always wear sunscreen to help protect both you and your family from the sun’s UV rays. The Cancer Council urges Australians to wear sunscreen all year round - even on overcast days, UV radiation can be highly dangerous! There are two types of UV radiation - UVA and UVB. According to research, UVB rays are mainly responsible for sunburn, while UVA rays can penetrate deeper into the skin and cause long term damage. However, with so many choices and different types of sunscreen, knowing which one is right for you can be hard - but it doesn't have to be. 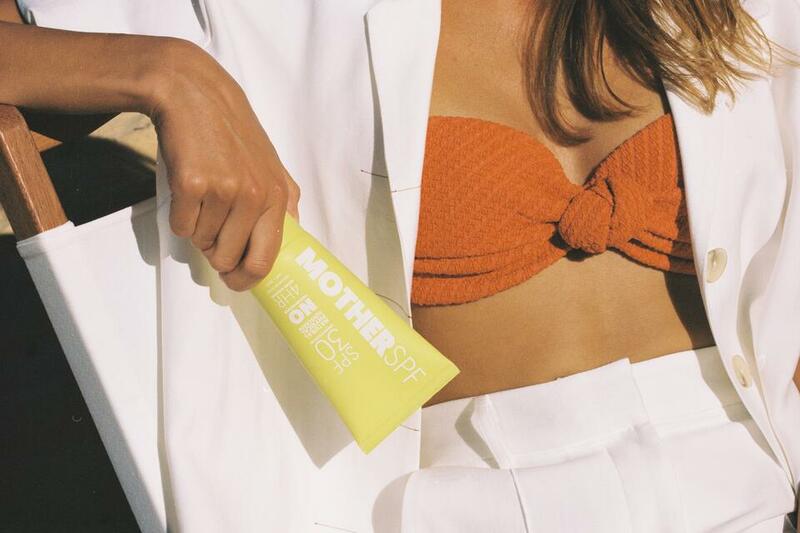 Whether you’re looking for a sunscreen for your face as a natural anti-ageing product, for your kids to use every day at school or daycare, or just for long days at the beach, here at Nourished Life we have you covered with sunscreens for the whole family. When choosing a sunscreen for you and your family, did you know that there are two types available? Both chemical and physical sunscreens are designed to help protect you from UVA and UVB rays, however they work in different ways. Where one contains active ingredient/s to absorb UV radiation, the other works to reflect it. When choosing a sunscreen there are some considerations when it comes to finding the formula right for you. What is a chemical sunscreen? According to Choice, the ingredients in chemical sunscreens may cause irritation, allergy or sensitivity, so patch testing is always recommended prior to using any chemical sunscreen. Some types of chemical sunscreen may only protect skin from UVA, others only UVB, and some offer protection against both UVA and UVB. 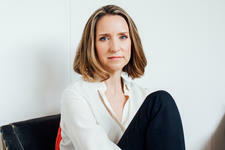 "Broad spectrum" sunscreen blocks both UVA and UVB rays - in Australia, all sunscreens over SPF4 must be broad spectrum. What is a physical sunscreen? Unlike chemical sunscreens, physical sunscreens help to protect your skin from the sun by using natural minerals to create a physical barrier (as the name suggests), rather than absorbing rays. These natural alternatives use ingredients such as Titanium Dioxide and Zinc Oxide to reflect the sun's UVA and UVB rays - both of these offer broad spectrum protection. According to Choice, physical sunscreens may also be more suitable for those with sensitive skin, and are particularly recommended for children. According to SunSmart, "Sensitive and toddler sunscreens usually use scattering ingredients such as Zinc Oxide and avoid ingredients and preservatives that may cause reactions in young skin." Although they are heavier than their chemical based counterparts, more recent physical sunscreen formulations differ from traditional heavy or thick Zinc sunscreen formulations, resulting in a lighter and sheerer finish than the old 'ghostly' or 'pasty' look. At Nourished Life, we only stock physical sunscreen brands across our SPF 30 natural sunscreen products and across our range of SPF 15 facial moisturisers. The Cancer Council recommends that sunscreen should be applied 20 minutes before sun exposure to create the intended protective barrier. Physical sunscreen should be applied liberally and evenly to clean and dry skin, ensuring enough is used for adequate protection. For adults, the recommended amount is approximately seven teaspoons to cover the entire body (including arms, legs, the torso and face.) Sunscreen should also be reapplied every two hours at least, even if the sunscreen is 'water resistant', as physical exercise can affect how the sunscreen works. 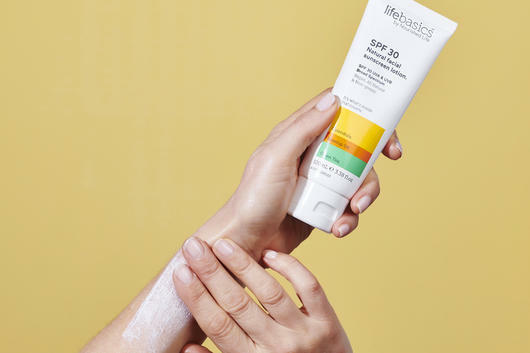 The Life Basics SPF 30 All Natural Facial Sunscreen $24.95, is great for wearing every day beneath makeup, containing deeply hydrating Green Tea, Rosehip Oil and Calendula to soothe and nourish skin while providing long lasting UVA and UVB protection. 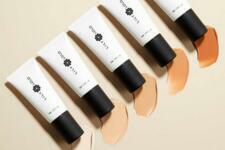 The Eco logical Face Sunscreen SPF 30+ $19.95, can also be worn daily. This gentle sunscreen can be worn in replacement of your regular moisturiser or layered over the top. 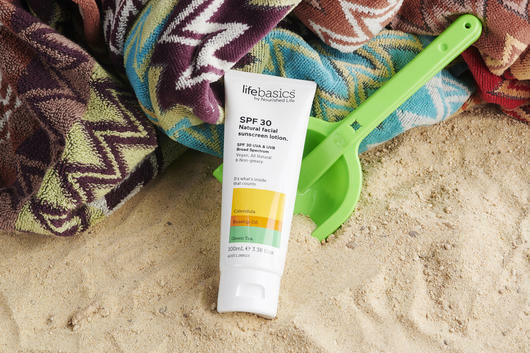 Containing antioxidant-rich ingredients including Cucumber and Green Tea, this sunscreen hydrates and restores. Ideal for the whole family, UV Natural Sunscreen SPF 30+ $16.95, can be used all year round. This fast absorbing formula uses a combination of nut oils and 24.8% natural Zinc Oxide to protect and nourish your skin. Kids love playing outdoors, so it’s important to keep their precious skin protected! The Eco Logical Baby Sunscreen SPF 30+ $19.95, is specifically formulated for delicate and sensitive baby skin. This water resistant sunscreen is filled with moisturising ingredients including Jojoba, Shea Butter and Avocado. The WOTNOT Sunscreen SPF 30 $19.95, is also gentle enough for babies and children of all ages. This sunscreen contains soothing Aloe Vera and Shea Butter for a smooth, moisturising consistency, making it nice and easy to apply all over the face and body. Read more about natural sunscreen options for kids. The UV Natural Sports Sunscreen 30+ $28.95, is a great option for anyone who plays outdoor sports. This non-whitening physical sunscreen protects for up to three hours from both water and sweat. You’ll love this nourishing cream which is filled with natural ingredients including Macadamia Nut Oil and Vitamin E.
For long days at the beach or by the pool, you need a water resistant sunscreen. The Soleo Organics Sunscreen SPF 30+ $16.95, is water resistant for up to 3 hours. This non-greasy, easily absorbed sunscreen can be used on both the face and body during summer and all year-round. If you’ve spent too long in the sun, you may want to soothe your skin with a balm of gel. The Badger After Sun Balm $21.95 is a gentle balm filled with nourishing ingredients including Beeswax and Jojoba oil. Otherwise, you can't go past that soothing and cooling feeling of an Aloe Vera Gel!